Submitted by lmcshane on Sat, 08/27/2011 - 14:34. Development in CLE - Joe Santiago style...this strip is how development is "planned" on West 25th, too -acknowledged that "chains" are most likely development to occur. Former CLE councilman Joe Santiago moved to Florida. Questions remain especially on how he used building inspectors to move development in the ward while he was the councilperson. Submitted by lmcshane on Sat, 08/27/2011 - 14:46. Here are some photos taken last night along Clark Ave. in Cleveland. 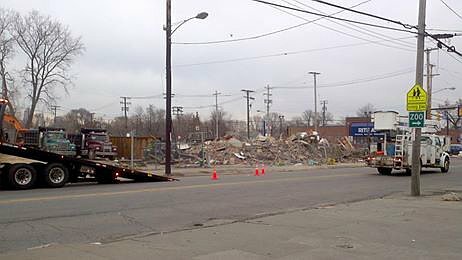 This is the promise of local retail zoning and "development" in Cleveland. Your tax dollars demolished buildings so this "development" could mushroom in your neighborhood. Is this the improvement you envisioned? What about those power lines--still not buried in conduit? Does it matter? Evidently, not. Submitted by lmcshane on Mon, 04/07/2014 - 18:25. Submitted by lmcshane on Sat, 08/27/2011 - 14:01. For the most part--the entire West 25th St. corridor and parts of Scranton are to be designated Local Retail Zoning. There is some development planned for the large area cleared (to some degree at taxpayer expense) across from Metrohealth at Woodbridge. The Wong family, who own a Chinese restaurant in the Peter Rubin/Coral Group plaza in Brooklyn Centre, are lined-up (by the negotiations with the councilman and TWDC) to lease space in the area for a possible "sit-down" restaurant and the Wong family will possibly profit from the sale of property they own on Woodbridge when the parcels are assembled for development. The Councilman, at the public meeting, refused to identify the overall project developer, citing confidentiality and claiming that it's not part of the public process. Personally, I would think that it is information that residents have a right to know as public dollars (especially in terms of the monies directed to TWDC) are co-mingled with this development. Also--the subject of the Aragon Ballroom came up and no information was forthcoming at the meeting. Councilman Cummins and/or TWDC or Detroit Shoreway's staff are welcome to provide better information than I have provided here. Please contact me via post at this site, if any of the information provided is inaccurate. Update from Henry Senyak - Fulton Clark intersection home to new RALLY's - what brilliant minds we have here in NEO!! NOTE: School and Zoo - fabulous!!! Submitted by lmcshane on Sat, 08/27/2011 - 16:02. Submitted by ANGELnWard14 on Sun, 08/28/2011 - 01:04. Out of towners have more awareness of these contracts than local contractors...who are being disserviced by a failure to communicate these opportunities locally..
HECK...even the VA Hospital CONTRACTORS at WADE PARK VA HOSPITAL ARE COMING IN FROM MICHIGAN TO DO THE LABOR WORK!!!! But, the work is amazing over there at the VA Hospital on Wade Park.....Thanks to all those workers driving in from Michigan and staying on Murray Hill for all your sacrifices to rebuild our VA Hospital!!! God Bless You! Remember CORRUPTHOGA....THERE IS NO LOYALTY AMONGST THIEVES!!! Submitted by lmcshane on Sun, 08/28/2011 - 14:23. This may seem off topic--but from my visit to Maryland--I was told by a businessman from the area that the final and most complicated engineering part of opening the Great Allegheny Passage, involved reconstructing the mile long tunnel under Mount Savage--American companies submitted bids, but the project was completed by a Canadian Company that came in lower and did not have to comply with U.S. federal hiring restrictions. Submitted by lmcshane on Thu, 09/05/2013 - 09:32. Saw Jay Miller of Crain's Cleveland WALKING in the Warehouse District on August 14, 2013 - asked him to run an update on his earlier article on W. 25th corridor. City of Cleveland and local CDC dropped ball on ALDI which negotiated to move to First Interstate Steelyard - there has been no official confirmation from the company or CDC that they will stay on Pearl in Brooklyn Centre neighborhood. Why would they? ALDIs is an ANCHOR. Former YMCA building sold to shadowy non-profit RezThreads with Robert McCall continues to sit vacant. McDonalds at corner has expanded with two lane drive thru. No real controversy like in Ohio City. McDonalds has been an asset and an ANCHOR. Wael Saleh bought former Anter property on corner of Pearl Denison and put in Happy's Pizza. He also bought Downtown Autoparts and has tentative plans for a beauty supply store there. Brooklyn Centre Plaza in Coral Group has not seen investment in the stores there and lost several anchors including Best Cuts. Rumored that they are slated to build International Plaza on land cleared across from Metro. Wong family in Brooklyn Centre Plaza have admitted they are part of the development plan there to put in a sit-down restaurant. CVS Pharmacy at Brooklyn Plaza is an anchor. Gallo gas station at corner of Pearl and Bradwell closed due to poor health of owner and is acruing massive tax lien. Kidney Dialysis in restored building on Pearl/Archwood continues to be an anchor. Rivera Insurance received some storefront money to repair their building across from ALDIs (the old greenhouse, which they also own was hit by a car and is boarded). WSEM is due to move their Food Pantry from the current Brookside. Methodist Church still owns storefront but it is in bad repair and they want to sell. Methodist Church recently sold historic mother church on Archwood to Bethlehem Temple of Praise. Dickey (an attorney) owns five decrepit properties including historic building on corner of Garden and Pearl. Historic Brown's Lanes is vacant again with damage to exterior from massive Sandy storm. And, related- the push this year will be to get 3119 and adjacent Victorian on Denison commercial corridor demo'd. The non-profit has been strong-armed into the demo option despite FACT that the community through two-year Section 106 process has explicitedly NOT settled for demo as the mitigation. Councilman Cimperman, Councilman Cummins and, obliquely, Councilman Matt Zone can affect positive changes that will benefit the region and the adjacent Brooklyn Centre and Old Brooklyn neighborhoods. The Metroparks is the key player and will be going into another levy year. For very little effort, Metroparks can partner with Art House with a similar arrangement that has benefitted Baycrafters and the Great Lakes Science Center at the Metroparks Huntington Beach. As we go into fall - my neighborhood is slated to lose our primary grocery - no one is saying anything about this major F-UP by City - is anyone proposing a new grocery to replace ALDIs?? with Nelson Cintron Jr Brian J. Cummins Janet Garcia Brian Kazy - also know that Brookside Center Food Pantry has moved to Masonic Building, but with less community services provided. What is the plan here?? Attorney "Dickey" is actually "Hickey"
Submitted by Gone Fishin on Thu, 09/05/2013 - 21:21. Attorney "Hickey" - not "Dickey". John Hickey. His property has been in bad shape for over 15 years. Via FB - News of Rallys on Clark -Food Desertification! Submitted by lmcshane on Mon, 04/07/2014 - 18:27. How exciting - the marvellous replacement of food options in Ward 14 to closing of Aldis will include a Rally's - across from family-owned bakery -what federal programs will this qualify us for in the future??!! Submitted by lmcshane on Thu, 09/05/2013 - 23:39. Submitted by lmcshane on Fri, 11/08/2013 - 10:05. Rubin Coral Group - Brooklyn Plaza is almost completely emptied out - Sammy's Furniture (money laundering) has cleared out of the former Block Buster location - O'Reilly's is gone, Uniform store, Best Cuts - barely hanging on --CVS. Expect news any day now that mystery "Asian" developer will break ground on properties across from Metrohealth - so we have more strip development while trashing the former plaza in Brooklyn Centre. This is "development" CLE style - and the "planners" collect their salary for this brilliance.